Myth #1 Auto dealers will always have the best loan rate & payment. This isn’t always necessarily true. Credit unions and other financial institutions also offer competitive rates compared to dealerships. Those who are looking into buying a car should shop around and not only compare rates, but also compare restrictions, to find the best deal that fits their wants and needs. Myth #2 Seeking multiple pre-approvals/loan offers will destroy your credit rating. An individual’s credit score will not be affected negatively if seeking multiple offers. The analysis will have to be made within a certain time period of 14 days. However, keep in mind while shopping around this may cause multiple creditors to request a consumer’s credit report. Myth #3 Auto loan refinancing is expensive. It’s actually the opposite. Refinancing can drastically reduce your monthly payments and is an option you should consider. Have you stopped into your local First Financial branch location to see how much we may be able to save you each month by refinancing your car loan? Or give us a call at 732.312.1500, Option 4. Myth #4 Refinancing isn’t an option on an auto loan. Most people know that refinancing an auto loan can provide the same benefits as refinancing a home loan. They both can save you a lot of money by lowering the monthly payment or interest rate. Many may not know that refinancing an auto loan is actually much easier than refinancing a home loan. You might want to consider refinancing if your current car loan interest rate is above 6 percent, doing so could save you hundreds of dollars each year if you are approved! 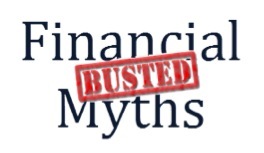 Myth #5 Consumers think that even though Credit Unions have better rates – that you have to have perfect credit to get them, or be part of a union or work at a certain company to get them. You do have to be a member of a Credit Union to get the Credit Union’s rates, and the rate you qualify for is based on your credit worthiness. However, most people do not realize just how easy it is to join a Credit Union these days, and that Credit Unions will at least try to work with you and help you get on the right track to a better financial standing if you aren’t currently. The majority of Credit Unions how have community charters – where you simply need to live, work, worship, or attend school in a certain area in order to become a member of that particular Credit Union. That’s certainly the case at First Financial – to join $5 in a Base Savings Account is needed at all times, and you must live, work, worship, volunteer, or attend school in Monmouth or Ocean Counties in New Jersey. Plus, once you are a member – your immediate family can join too. As always, First Financial offers great low rates – and they’re the same whether you plan to purchase a new or used vehicle! This entry was posted in Car Buying, Auto Loans and Financing and tagged Auto Loans, Auto Loans and Financing, AutoSMART, Car Buying, First Financial Federal Credit Union, Refinancing Auto Loans by Marketing Coordinator Nicole. Bookmark the permalink.